The television is such an integral part of our daily lives that we can’t imagine life without one. In fact, many of us have more than just one in the house so each member can watch what they like, unlike in the old days when there was just one set in the house not to mention, just Doordarshan to watch! Now with the wide variety of channels in a multitude of languages available today, televisions are companions for people of all age groups. Credit Satellite TV for bringing us the variety, with viewers bring spoilt for choice as far as choosing their preferred Direct-to- Home satellite TV provider is concerned. Nowadays we watch the latest international movies and TV series, get the latest news, sports updates, and a plethora of high-quality content, all thanks to the explosion of these DTH services. With choices in monthly packages that can be tailored to the household’s viewing preferences, discounts on long-term subscriptions, easy installation and mobility of connections, not to mention the ease of online payments coupled with some great DTH recharge offerings, top-ups, and upgrades, the Indian viewer of today is King. Multiple players mean healthy competition, and an effort to give us the best. 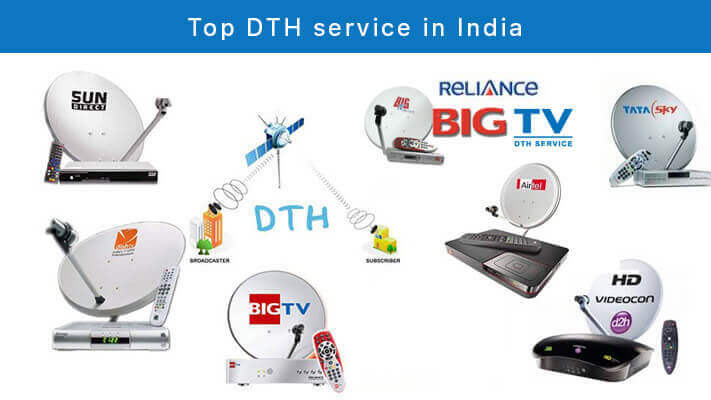 We’ve put together a list of the top 7 DTH service providers in India so you find it easier to choose one that suits your needs best, whether it’s for a primary connection or for additional ones. VISIT NOWAirtel is one of the leading DTH service providers in India. 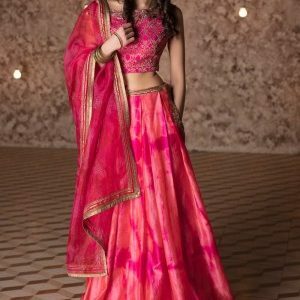 This brand was launched by Bharti Airtel in 2008. Today Airtel has nearly 400 channels including several HD or High Definition channels. Its subscriber base is a few million across India and that’s not surprising thanks to its wide variety of channels covering entertainment, movies, lifestyle, education, lifestyle, sports and news to name a few categories. It goes without saying that Airtel also has plenty of regional language channels in all of these categories. In, addition Airtel allows its customers to record programs, and also get multiple connections through one dish. This multiple connection facility is particularly beneficial when entire buildings or housing complexes subscribe to the same provider and get great discounts and customised packages. Dish TV was launched by Zee TV and is popular across the country. This is the oldest DTH provider in India and still retains its position as a leading player with constant upgrades in technology and a wide range of channels appealing to a varied audience. Dish TV remains one of the cheapest DTH operators in the market today and its economical packages have made it a favourite amongst the lower income and middle income households all over the country. Dish TV also has features like child lock, interactive TV, games, apart from the expansive range of channels in English, Hindi and regional languages. Like most of the other DTH operators Dish TV also has attractive combo packs, special deals and offers where customers get a bundle of channels at superb rates with plenty of freebies thrown in. A subsidiary of Reliance Communications, Reliance TV was first launched as Reliance Big TV in 2008 and later rechristened Reliance TV. The service is available pan India. Apart from an impressive spectrum of channels covering sports, news, lifestyle, music, movies, entertainment and much more in mainstream and regional languages Reliance TV also offers additional options like pay per view movies, free internet games, etc. Using the latest technology Reliance TV gives customers a premium viewing experience with crystal clear picture and theatre quality sound. Launched in 2006 Tata Sky was the second player in the DTH market in India. A joint venture between the Tata Group and 20th Century Fox, Tata Sky is one of the top DTH brands in India today. The addition of HD channels only boosted its customer base and Tata Sky is known as a leader in the market for embracing the latest technology and launching relevant products keeping its customers happy with the newest and the latest. The home brand Tata Active channels offer content ranging from educational content for kids to cooking classes for grown-ups, dance classes, and lots more, offering their customers a bouquet of value added services via these channels. One of the biggest feathers in the Tata Sky cap is being the first to live telecast the first quarter final of the FIFA World Cup 2014 in 4K UHD. Tata Sky was also the first to offer customers the facility to record, play and pause, and rewind live TV. Tata Sky subscribers get access to a few hundred mainstream English and Hindi channels plus a wide assortment of regional language channels making it appealing to Indians in every corner of the country. The competitively priced subscription packages with add-on packs for HD and SD channels. VISIT NOW The biggest attraction of Videocon d2h is the sheer variety of channels it offers. Customers can enjoy a huge selection of SD and HD channels with clear pictures and good clear sound thanks to the MPEG-4 technology that it uses. The brand offers its customers varied subscription packages that focus on a category of channels with affordable add-ons to the main package that cater to the entire family. The company boasts of 650 channels and services available all over the country giving it a wide and varied customer base. The company offers four grades of set top boxes, a variety of add on exclusive kids’ channels, big discount on long term subscriptions and recharge, common antenna options for multiple connections, and lots more giving customers the chance to customise as much as possible. Sun Direct is the only regional player in the DTH industry and concentrates on South India. It does offer mainstream English and Hindi channels but the main focus is on the South Indian language channels. This Chennai based DTH company is a division of the Sun Network and was launched in 2007. With their focus on South Indian channels they are market leaders in the region but have a smaller presence in the rest of the country. The language specific subscription packs are a major attraction for niche audiences and Sun Direct has captured a huge chunk of this market thanks to its focused products with more than 10 million subscribers. VISIT NOWOwned and operated by public service broadcaster Prasar Bharti (Doordarshan) DD Free Dish, as the name suggests, is a free DTH service that was launched in 2004. The service has a limited range of channels. Subscribers pay a nominal installation and hardware cost at the start and there is no expense or monthly subscription amount that has to be paid thereafter. Subscribers get to see a medley of national and regional Doordarshan channels and limited private channels. The channels cover a variety of subjects including entertainment, news, sports, shopping, health, cinema, and music. The biggest plus point for DD Free Dish is that apart from the very reasonable expense at the time of installation there are no further costs so viewers enjoy all the content broadcast absolutely free. Now that we have laid out all the options for you, go ahead make your pick!